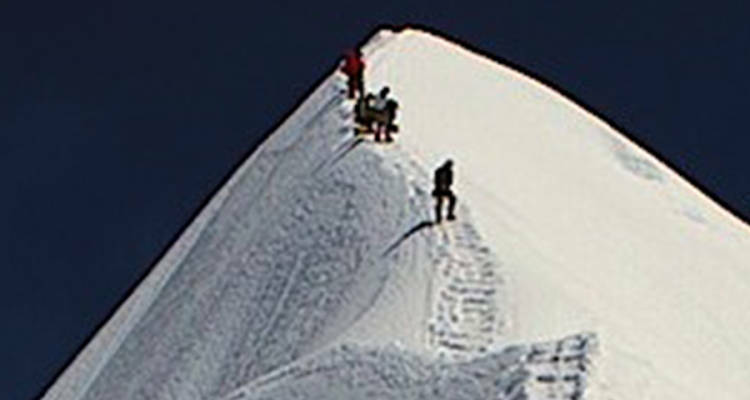 This is an ideal Peak for people are the beginners who would prefer a Himalayan experience but easy. Island Peak which lies south of Everest metering 6182 above sea level also offers a combination of a trek to Everest Base camp. Trekking to one of the most famous trek in the world, Everest Base camp trek and then conquering Island Peak 6182m/ 20276 feet is something people do once in life. Island Peak that is situated between the highest Himalayan ranges of the world is famous for the climbers who would like to experience high altitude climbing within few days, meet the famous Sherpa people and knowing their culture along with one of the best adventure. Total trip Duration: 21 days, 17 days trek and climb, 3 days in Kathmandu. Accommodation during the trek: Tea houses/ lodges and camping. Highest point of the trek: 6182 meters/ 20276 feet Island Peak. Highest peak view: Everest 8848m/29021 feet. View of Lotse (8501m) 4th highest, Makalu (8463m) 5th highest in the world. View of Khumbu glacier and ice fall. Meet the Sherpa people (famous for climbing Himalayas) and know their culture. Tangbouche Monastery the most famous monastery in Khumbu valley. Adventure mountaineering experience with Island peak climbing. Day 02: Sightseeing in Kathmandu: Pashupati Temple, BouddhanathStupa, Patan Durbar Square and Swyambhunath(Monkey temple), Hotel. Day 03: Kathmandu to Lukla (2840m) to Phakding (2630m) 40 minutes flight 4 hours, 100m uphill,380m downhill, Lodge. Day 06: Namche Bazaar to Dole 4200, 5-6 hours, 620m uphill, 230m downhill, Lodge. Day 07: Dole to Machhermo (4350m), 4-5 hours, 520m uphill, 150m downhill, Lodge. Day 08: Machhermo acclimatization day visit to view point in Machhermo Valley. Day 09: Machhermo to Gokyo 4 hours 4730m, Lodge. Day 10: Gokyo to Gokyo Ri 5320 to Chola Pass 5365m, Zongla 4700 meters. Day 11: Zongla to Lobouche 4910 m 4 Hours, Lodge. Day 12: Lobuche to Gorekshep (5153m) to Everest Base camp (5360m) 450m uphill, 270m downhill, Lodge. Day 13: GorekShep to Kalapathar (5545m) to Dingbouche (4380m), 8 hours Lodge. Day 14: Dingboche to Chhukung Valley 4740m, 4 hours, Lodge. 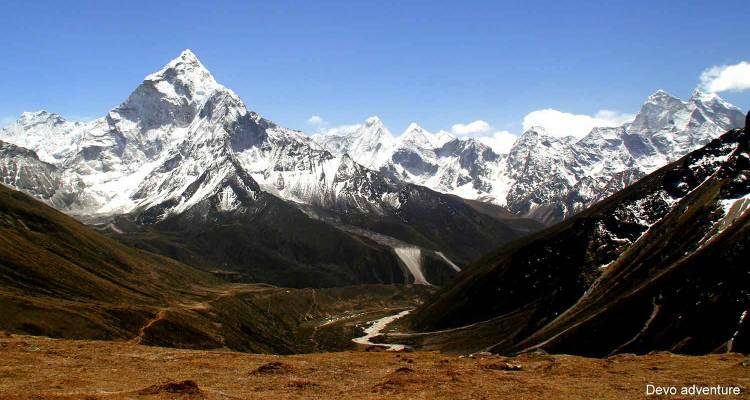 Day 15: Trek Chhukung Valley to Island Peak Base Camp 5210m, 3-4 hours, Camp. Day 16: Island Peak Base Camp to High Camp 5600m, 2-3 hours, Camp. Day 17: Climb the Island Peak, 6182m and back to Chhukung Valley 9-10 hours, Lodge. Day 18: Chhukung Valley to Namche Bazzar (3440m), 8-9 hours, Lodge. Day 19: Namche Bazaar to Lukla (2840m), 200m uphill, 900m downhill, Lodge. Day 20: Lukla to Kathmandu: 40 minutes flight, Complimentary massage, Dinner at cultural restaurant, Hotel. Day 21: Departure Day. A day to say goodbye and to take happy memories back home :).